Stoke City are set to make a formal bid for Birmingham goalkeeper Jack Butland. The 19-year-old England international earlier because he wants regular football. If Stoke are able to complete a deal, Butland would return to Championship side Birmingham for the remainder of the season. City have admitted that they are open to offers for first-team players because of financial problems. After rejecting the Chelsea move, his agent, Gary Mellor, told BBC Sport: "Jack's enjoying playing for Birmingham and he is gaining valuable experience. "He will listen to what any club that meets Birmingham's asking price has to say, but playing is of paramount importance for Jack." Butland spent the majority of last season on loan at Cheltenham and was called up for Euro 2012 after John Ruddy broke a finger. He played for Great Britain at the Olympics and made his England debut in the 2-1 win over Italy in August. 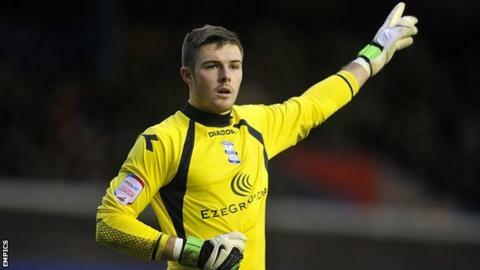 Acting chairman Peter Pannu admitted in December that Birmingham could be forced to sell Butland this month. Southampton and Everton attempted to sign Butland last summer and he has also been linked with Liverpool, Fulham, Newcastle and Manchester City.